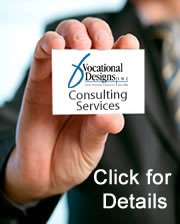 Vocational Designs, Inc. | Career Planning, Vocational Rehabilitation, Disability Management, and Litigation Support Services. Steven D. Koobatian, Ph.D., C.R.C. Leaders in career planning, vocational rehabilitation, disability management and expert litigation support services. Superior and Federal Court expert testimony involving employability, earning capacity, vocational rehabilitation, spousal support, wrongful termination, sexual harassment, employment discrimination, and job accommodation/interactive process good-faith issues.